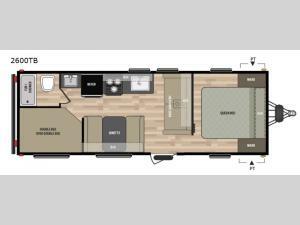 Step inside this Springdale SS travel trailer 2600TB and see just how convenient your camping can be. There is sleeping space for up to nine individuals, and all the amenities needed to make traveling fun. A booth dinette provides a place for dining and playing board games, plus it too can be made into additional sleeping space, if needed, by folding down the table. Double bed bunk beds can be found in the left rear corner of this trailer that the kids will just LOVE. Inside and outside there is plenty of storage, with the overhead cabinets and cupboards inside and pass through storage outside.